Posted December 31, 2015 by The Rapid & filed under In The Community. New year, new you, right? With 2016 almost here, you may be searching for something meaningful to stick to in the year to come. Here’s one goal we think you should try on for size: riding the bus more. OK — We may be a little biased, but hear us out. Getting on board the bus is the perfect all-encompassing goal for knocking out some other common new year’s resolutions. Whether you’re looking to get more exercise or to make more time for yourself in 2016, riding the bus can help! 1. Squeeze in more reading. Riding the bus means more time to catch up on your reading list. Instead of battling traffic in your car, get on board to add some extra reading time into your busy schedule. You can even ride with us to several library locations and local bookstores like Bombadil Books (located off of Routes 1, 2, 3 & 5) to keep your library stocked! 2. Get more steps into your daily exercise routine. Did you know that public transit riders get more than three times the amount of physical activity per day than non-riders? If getting in shape is in your plans for the new year, riding the bus is a simple way to fit more walking into your daily routine. 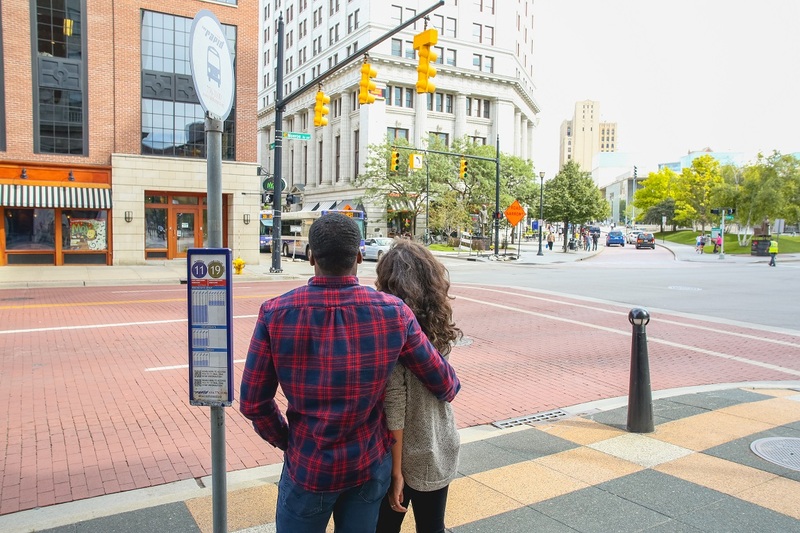 Start by using our “Nearest Stop” tool to see bus stops nearby: http://ridetherapid.org. Gas prices may be low, but for less than $50 you can ride The Rapid as many times as you want for 31 days. Riding the bus offers a cheaper transportation alternative to driving, and it may just make you rethink your spending habits in the process. Seeking to expand your social circles in 2016? Riding the bus offers a chance to meet new people in your community. Maybe you’ll get to know your neighbor better, gain a new friend, or meet someone that inspires you in the community. 5. Reduce the stress of your work commute. Sick of fighting traffic and the general stress that comes from your daily commute? Let the bus be your beacon for finding stress relief. Let us worry about getting you where you need to go safely and efficiently. Getting on board in the winter can be a perfect way to ease stress and get a feel for riding the bus more. Sometimes taking a little time for yourself can be just what you need in your day. When you ride the bus you have time to enjoy a podcast, listen to your favorite musicians, do some work, or even reflect on the day ahead. Riding the bus (literally) offers you a window to your community. While you’re traveling to your destination you have a chance to enjoy your surroundings, which often leads to finding new businesses and locations to visit. Getting on board the bus may mean trying a new restaurant or visiting a new local shop in your neighborhood. Do you plan to ride the bus more in 2016?